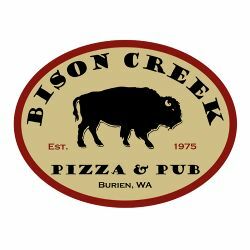 Bison Creek Pizza & Pub - Bison Creek Pizza has been serving South Seattle communities since 1975. The original Bison Creek Pizza was located in West Seattle. Bison Creek Pizza has been serving South Seattle communities since 1975. The original Bison Creek Pizza was located in West Seattle. A few years later, the original owners decided to expand their enterprise of excellent pizza to Burien, Washington. This is where Bison Creek Pizza resides today. Some of you may recognize the building because it used to be the Burien Theatre, which debuted in 1957 until the 1970s. In fact, you can see the original projector holes above the antique 1890s back bar. The Burien Theatre closed their doors shortly after the Lewis and Clark Theater opened. The next tenant in this historic building was Big Bob’s Pipe Dream Restaurant. Many locals remember this restaurant for its large, unique 1918 Wurlitzer Organ from Seattle’s Coliseum Theatre. After Big Bob’s Pipe Dream, the restaurant was renamed Pizza Works. Shortly after in 1977, Bison Creek Pizza opened the Burien location after great success in West Seattle. In 2008, Bison Creek Pizza & Pub was renovated to bring back historic memories. As the building has changed, we can assure you our homemade recipes have remained the same. We hope you enjoy your dining experience and look forward to serving you in the very near future!